My Tampa Bay Mommy : Disney Store - 40% Off Swim Shop + Star Wars Flip Flops $3.99 & More! Disney Store - 40% Off Swim Shop + Star Wars Flip Flops $3.99 & More! Disney Store is offering 40% Off Swim Sale which means you can snag great deals on Beach Towels, Swimwear, Accessories and More! 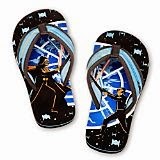 I know a few boys that would love the Star Wars Flip Flops for $3.99 or Swim Trunks for $12.99! No coupon code required, online price reflects savings. Shipping starts at $4.95, FREE on on orders of $75 or more with code SHIPMAGIC at checkout.